Erin Bow’s debut novel Plain Kate was a masterpiece. Bow’s wondrous way with words and her story of unthinkable choices wrapped me up in emotion and didn’t let me go. It was the sort of experience that turns you into a rabid fan, scouring Goodreads and/or Amazon for any hint of a new release. When I looked through the Scholastic catalog last week I struck gold – Bow’s next book comes out this fall. 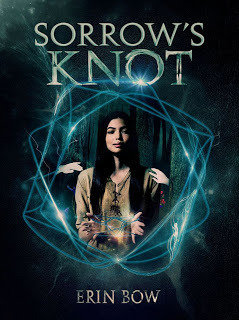 Sorrow’s Knot will be released by Arthur A. Levine (Scholastic) in November 2013. In the world of Sorrow’s Knot, the dead do not rest easy. Every patch of shadow might be home to something hungry, something deadly. Most of the people of this world live on the sunlit, treeless prairies. But a few carve out an uneasy living in the forest towns, keeping the dead at bay with wards made from magically knotted cords. The women who tie these knots are called binders. And Otter's mother, Willow, is one of the greatest binders her people have ever known. How did I miss reading Plain Kate? A masterpiece, huh? I will definitely have to make time for it sometime soon. Then we can be excited about Sorrow's Knot together! :D Great pick! I'm wanting to read this one too. Great pick. I haven't read Plain Kate but I've heard such good things about it. This one sounds just as awesome. Great WoW pick! Huh, this sounds really good. I've heard great things about Plain Kate, but have yet to come across a copy. Never read this author, but that blurb sounds intriguing. I'll have to check out Plain Kate now. Thanks for sharing! oh goodness, will there never be an end to all the books I want to read???? I've never heard of this author, but I love the sound of the book. Definitely worth the time to check out. Here’s my WoW this week!